My inspiration for setting the wolf into hiding behind the trees was from a newspaper photo in 1986. A young girl was mauled by a mountain lion in a state park in southern California, and later, when the father looked at the photos he had taken that day, the cat was only barely visible, lurking in the bushes while the little girl played in the stream, catching tadpoles. The drama in that photo of portended danger has never left my mind. Fabulous ! Just like the tale. Fav. 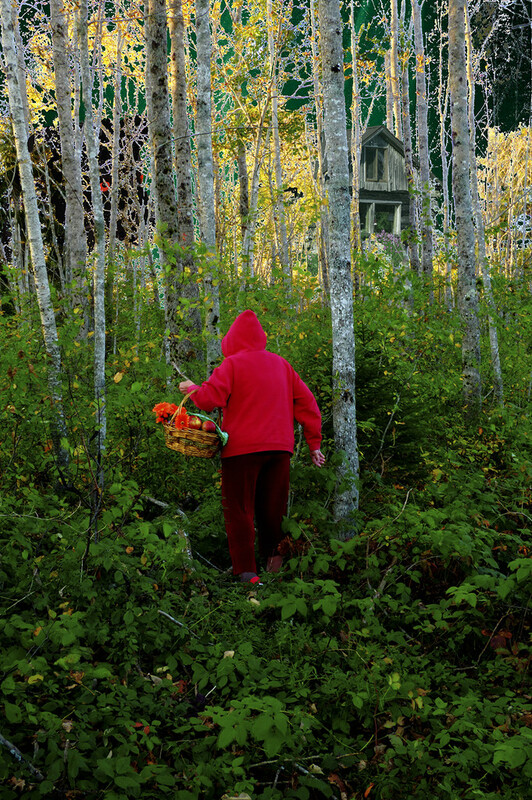 Ahhh, little red riding hood. Clever capture for the theme. The red really is so brilliant and draws you into the shot to see if the bad wolf is lurking. Well done and what a beautiful basket of goodies Li'l Red has! This is VERY fun! :) Clever processing! Little Red Riding Hood , or Little Red Ridinghood, also known as Little Red Cap or simply Red Riding Hood, is a French and later European fairy tale about a young girl and a Big Bad Wolf. The story has been changed considerably in its history and subject to numerous modern adaptations and readings. The story was first published by Charles Perrault. That`s my first thought . A great capture and processing on this very nice pic. Fav. @voiceprintz @lily @scarybird Thank you all for the kind words! As Ken took the photo for me, even I was surprised at how the red popped! I wish I could have made the wolf more visible and menacing, but it was a learning curve, and I did have fun doing it! @pyrrhula Great information! I knew it had had changes made through the years...even this is my interpretation, given my recollection of a terrible incident years ago! I'm spending way too much time having fun with the collages! Thanks for making it all worthwhile and your fave! Amazing and dramatic image. Fav. @Weezilou Oh, thank you so very much.....from the very bottom of my heart! You did not happen to see one that said "Lambchop", did you?! That was Karma and Trouble's predecessor, a most amazing kitty, and one I will never forget as long as I live! How wonderful to have a pet cemetery.....I would be spending some time there as well, studying the names and stories. Ours are buried in our back yard, and I get to say hello them every day I pass by. Great photo Louise, love everything about it. Fav. !! This is so creative, Louise! What fun you (hopefully) had in putting this together, from the role playing to the editing work. Very neat idea. Brill set-up. That wolf spooked me when I finally saw him. Sad story.